I wondered when rigor mortis would set in, or if it already had. 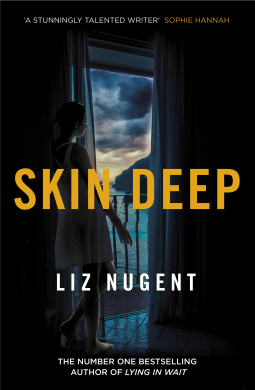 Liz Nugent the author with the killer first lines does it again with her third novel Skin Deep! Not only is the first line a shocker she has confirmed to me that perhaps my preference in psychological novels is for the slow build rather than the flashy twists and turns. Slow burn should never be confused with boring, rather in the context of this book it means that every word matters, it has been considered and it means something. Once I had cleared the bottles away and washed the blood off the floor, I needed to get out of the flat. Cordelia Russell is living on the Côte d’Azur using her looks and her charm to get by. But her age is catching up with her, no longer do the gentlemen wish to buy her food and drink for the pleasure of her company. But what journey had Cordelia been on before she arrived and realised that beauty is only skin deep. I could probably have been an actress. It is not difficult to pretend to be somebody else. Isn’t that what I’ve been doing for most of my life? This is a novel that explores the very worst of human nature, it pulls the reader to places that they would rather not know, insistently, gradually but before you know it you are face to face with it. This is an author who makes you need to know more on one level although you are repelled on another. This is a book where whether it is descriptions of flies buzzing round a corpse, or descriptions of settings, whether that be the blue sea of the Mediterranean or the bleakness of the tiny Island of Inishcrann , which translated from the Irish language means The Island of the Tree, the words used easily conjure up everything. In between the bleak life in the cold and the strange characters on the island we are treated to some folklore tales, those that root the island in the past. Horrid stories far from the fairy tales that we mock shudder at now. This just underpins the darkness, the bleakness and even if you can’t conceive of the ending, you know it will be bad. These are sinister tales that will play on your mind as much as the story unfolding before you. The more books I read, the more I appreciate this kind of superb plotting. The kind that makes you want to read the first page, and go back to the beginning with your newly found knowledge as you know some fantastic magic has been woven but you want to see how the stiches were made. If you want to feel empathy with the characters you read about, you will struggle with this book. This book isn’t populated with lovely people, although you might catch a glimpse of one or two trying to step out of the shadows. But in the main, those living on Inishcrann are superstitious and somewhat out of touch with the norms of life. Too few people trying to stop the authorities from declaring the island inhabitable, means that arguments are quick to flare, to fester and to poison. And as the little girl grows and moves away, to Ireland, perhaps the time for goodness has passed. But, you will be compelled by the characterisation, and it will be up to you to decide whether the character is born, or made. This is the third book that I have read by Liz Nugent, each one easily gaining five star status and each one leaving me amazed at the blackness of her imagination and gratitude that she sets it out with such graceful and engaging writing. I would like to say a huge thank you to Penguin UK for allowing me to read a copy of Skin Deep prior to publication, today, 5 April 2018. This unbiased review is my thanks to them and the author, Liz Nugent for a dark compelling read. Great review, now I just need to get the book. You’ve certainly been reading some compelling books recently. I’ve had an amazing run of books this year which is very welcome. This was extremely good and I had been looking forward to it for a while. Fab review, sounds like a dark read. Incredibly dark but absolutely fascinating with it. Looking forward to reading this at some point. I love Liz Nugents writing. Excellent review Cleo. Fantastic review! I felt a little disappointed by her novel Unravelling Oliver personally, but I haven’t read her 2nd book yet so there’s still hoping I’ll enjoy her work! Oh what a shame, I really enjoyed Unravelling Oliver – this one has a similar overall theme although of course the storyline is totally different. This does sound like a a compelling psychological novel, Cleo. And it’s a reminder that the characters in a book don’t have to be appealing to be interesting – or to at least be characters who make you curious. Your description of the story reminds me of the old proverb: Never date a woman whose father calls her ‘Princess.’ She probably believes him. Oh Margot I hadn’t heard that proverb but it makes sense… and it definitely fits the character in this book. The characters in this book, are certainly interesting. I did really love Unravelling Oliver although this one now competes for favourite read. My boss informed me the other day that people read these psychological novels to work out how to behave because they are actually sociopaths (he wasn’t referring to me at the time but a relation of his) I had to smile as he obviously hasn’t read one! Seriously no-one would want to model themselves on the characters in this book. Oh, yes, I experienced admiration for this author while reading Unraveling Oliver, so I definitely want to read more! Great review! Thank you – if you liked Unravelling Oliver this one has a similar overall theme so you should enjoy this one too. I’m not sure whether I would have a strong enough stomach, but.what a wonderful review! haha it might not have the desired effect if you aren’t dead though! She is incredibly talented and if you favour the darker side of human behaviour she’s an author to consider. although it sounds strange to admit-I do like the darker side! Wow! Thanks for a great review and another book to add to my ever-growing wish list. I’ve been looking for a book that can really get me back into the world of reading, and although the story sounds interesting I think I’ll pass on this one. I want to feel empathy for the characters because I know that makes me get attached and thrown into their world so quickly! That first line is a killer alright! !